I once know of someone who was suffering from schizophrenia. This man was disconnected from reality because he had not been able to deal with it. He suffered in silence and remained an outcast both to society and his family. The rejection, disgust and lack of understanding shown to him had worsen some of his behavior, some which were socially unacceptable. He told me that he had been hearing voices and seeing dark shadows- which became increasingly intense as the years go by. But due to his personality, his condition was not aggressive- it was just socially unacceptable. After many years of suffering from that condition, he died suddenly one day. But about 2 years before he passed away, I saw the light of life went out from his eyes. They say, ‘the eyes is the window of the soul”- and there is a lot of truth in this saying. When the eyes have no light and life in them- the spirit of the person is weak- usually due to a lack of motivation to live. It is possible for a person to slowly commit suicide because of deep loneliness and feelings of isolation- not everyone chooses to quickly end it through jumping down a building. We all live within the ‘realities’ that we create within our world. Society tends to have defined social norms that is supposedly be understood. When a person exhibit behavior that deviates from the social norm, that person is labeled as abnormal and sometimes being placed in a mental hospital. Decades ago, the treatment was even inhumane- those thought to have mental abnormality are given electric shocks at the arbitrary discretion of the doctor (there is no standard prescribed dosage to give as no one really understood how these treatment works)- the treatment had since been discontinued because it had shown to be ineffective. One of the main symptoms of a person suffering from schizophrenia is the fact that the person hears voices and have hallucination. Then, from what I observe, there is a thin line between a schizophrenic and a psychic then. Some people are born with natural psychic abilities. From young, they can see and hear things that many of us can’t. At first, they may assume that everyone else also sees the images or hear the voices. As they get shunned, bullied and beaten by their family and friends, they either learn to shut out these voices or eventually made peace with it. Some grew up to be psychics. But this ability can also be inherited by someone who became paralyzed with fear and unable to come in peace with it. Coupled with rejection from society in general, and not having anyone to open up to, the fear overpowers the heart of a timid person. The person can literally go crazy. 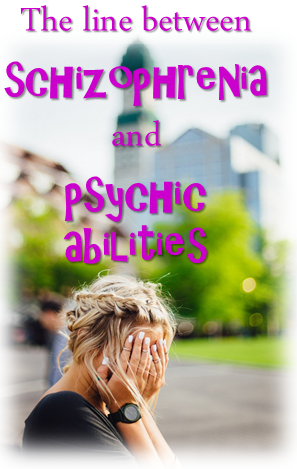 I have personally known a few friends who have inborn psychic abilities. Some of them become mediums and through channeling their spirit guides, use it to heal and to help solve problems of others. At first, their ego felt good that they have supernormal powers- but the activity of channeling or becoming a medium will eventually weaken their life force energy. We all know that if we give power to external things or people- we lose our true power and strength. So, it’s not hard to understand that the strength and life force that can be zapped out of us if we allow an unknown entity to take control of our body. A friend of mine had since given up being a medium as he realized that it weakens him and also causes a lot of havoc and disharmony within his family. Sure, he was able to help solve some of the problems of people, but he was an angry man who constantly took out his frustrations on his family. He now earns a honest living being a real estate negotiator and could control and manage his emotions better. I always remember what a psychically gifted middle aged man told me years ago- he had seen with his own eyes that about 9 out of 10 people who chose to open up their body to channel spirits would contract cancer in later life. People may think that they are channeling some kind of god, including Guan Yin or Lord Ganesh but in reality, it may just be a spirit or demons. A person who finds that she is born with psychic abilities- to perceive the invisible world should not allow her attention to drift outwards. Instead, she should use her ability to strengthen her own heart through practicing meditation and focusing within the confines of her body, heart and mind. Initially the ego may be inflated because of the ability and once the person allows her mind to move outwards to perceive others, it would eventually their hearts and minds. It would come to a stage whereby the person really start to hallucinate and would require psychiatric intervention. I once know this Caucasian lady who really has the psychic ability to perceive the invisible world and could read the minds of others. Yes, you did not read wrongly, she could really read the mind of others. She told me so herself. One day, while I was sitting and meditating in a quiet place, she came into the area. She sat down and instead of meditating, she tried to ‘enter’ my mind and perceive my meditation level. I was shocked and I mentally scold her: “Hey! What are you doing? ?You are violating my privacy- GET OUT!!!”. When I opened my eyes, her eyes were looking straight at me and she was upset- so I knew that she had read my mind. Needless so say, we never got along after that (that time, I had quite a short fuse myself). RELATED: So you want to quit your job to travel? But the fact is that, she was also undergoing psychiatric treatment in her home country. The specialist told her that she can choose to meditate as it seemed to have helped her or she would have to be medication. No doubt she could perceive and read the mind of others, but she judged others based on her own distorted views and philosophies. Her mind was not able to battle the influx of information, and her mind weakened to such a state that her mind started creating real hallucinations, voices and ‘messages’. It came to a stage where she was not able to distinguish what is real and what’s not. Her mind and perception, constantly wondering outwards, have weakened her energy. That is why meditation had previously gained a bad rep because there are meditators who end up in a mental asylum- now we know why. There is nothing wrong with meditation per se, but it is the way it is practiced- the mind that looked outwards and appease the ego that brings on disaster upon oneself. Some people start to see light, visions and start to hear messages during meditation. At this stage, the person may feel that he is invincible and powerful. Start to follow these images and the person would be heading to the path of destruction. A wise meditation teacher will tell you to ignore all this. If there is light, focus it inward. Be aware of the arising of feelings in the heart or sensations in the body. When other people scold or wronged you, instead of mentally judging them, learn to look at our hearts and see all the venom and bad thoughts that arise. See the ugliness within and strive to eliminate them. Yes, such practice can be downright boring- but it helps to build a stable heart and inner strength.